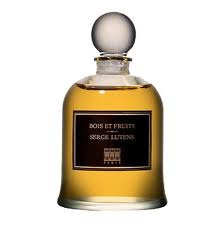 Once you know that Bois et Fruits is true to its name and also classically Lutens, you can guess what it is going to smell like first thing: wood and fruit. After the briefest flash of Lutensian weirdness that occasionally opens his scents (notably Jeux de Peau) comes a dense plummy-figgy scent reminiscent of Christmas fruitcake, mouthwatering and lightly spiced. Lutens uses fruit notes a lot, but he does not really deal in fresh fruit: it usually shows up cooked in some way, stewed or candied, or, as here, dried and then baked into something else. (Even Mandarine-Mandarin, which begins with a bright fresh orange, rapidly deepens into marmalade.) And yet there is something even odder going on: because there is plenty of cedar, and because I often get a whiff of wood-smoke from cedar, the overall effect is arresting and utterly novel — a wooden bowl full of smoked fruit. The bell jar up at the top signifies that Bois et Fruits is an Exclusive, available at the Lutens boutique in Paris, but that rectangular Export bottle lets you know that it was, as most of the Exclusives are sooner or later, made available for a time to the rest of the world. A few places still have it in stock: The Perfume Shoppe has it for $200, which seems to be the going rate for the Exclusives-turned-(temporarily)-Exports. 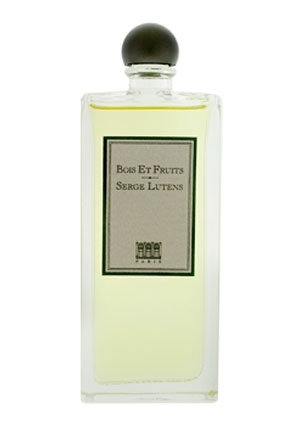 I think that if you own a bunch of Lutenses, then Bois et Fruits, lovely though it is, is not an essential addition to your collection: it has a lot in common with many of his other scents, from the cooked-fruit opening to the austere wood in the base. (It suggests elements of Chypre Rouge, Santal Blanc, Fille en Aiguilles, and others besides.) But if you are new to the line and not afraid to spend a few bucks to get your hands on some, Bois et Fruits would be an excellent starting point, because it is quintessential Serge: strange, and clearly not like mass-market scents, but charming and friendly nonetheless — an ambassador from a country you'll want to visit some day. *I will, though: I ordered a bunch of samples from The Perfumed Court, which was having a sale, and I got vials of just about every Lutens I hadn't tried yet, fifteen in all. It's like Christmas!